What is the typical size of human anatomy models? The specific size of human anatomy models varies greatly based on the type of model. For example, a model of the human eye is going to be much smaller than a model of the spine simply because of the size of the body part. 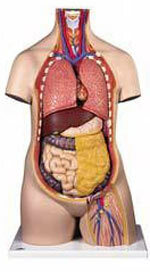 Most body organ models will have a base size of approximately 61/2 inches by 5 inches. This compact size makes them easy to store on a shelf, bookcase, desk or on a counter. Most organ models will be life-size in design and the model itself will not exceed the edges of the raised base. Large joint or spine models can measure up to 19 inches in length, especially models of the human elbow that include the arm, elbow, wrist and fingers. Foot models also tend to be slightly larger than the base. These models are centered on the metal rod that holds the model to the base. This centering means they are perfectly balanced and very steady and durable. Elongated models such as the spine feature specific areas of the spine, such as the lumbar region, and are also very balanced and durable. Entire spine, leg, arm or body models in life-size will be much larger, heavier and more challenging to store. What care is required in moving and storing human anatomy models? Human anatomy models are made of plastic, and are extremely durable and strong. They are also very lightweight and easy to carry or move from place to place. Generally there are no special care requirements for high quality human anatomy models. They can be cleaned using a soapy cloth with warm water if needed. The base and model can also be dusted as needed. Through the use of state of the art plastics the colors and textures on the models do not degrade or diminish over time and use. The colors will not fade with exposure to natural or artificial light. Are the most popular types of anatomy models readily available in most educational settings? Most science, anatomy and biology classes will have at least a few human anatomy models on hand. However, there are also veterinary models that are perfect for vet training, basic animal first aid classes and comparative anatomy projects or class activities. Having a good variety of different styles and options in anatomy models can really add reality to the abstract and difficult to visualize elements of a classroom. Students of any age will enjoy working with the models and will benefit in being able to actually see a replica of the body rather than just looking at a diagram or picture. How many human anatomy models per classroom are recommended? The number of 3D models per classroom varies with the specific class subject matter as well as the level of study. Elementary classrooms often have only one model for class use while middle school to college classes may have models for groups of students to work on. Having at least one model in the class is beneficial, the more models that are available the more students will use them and enhance their learning.